Learn everything to know about Smartloop platform. Smartloop platform enables you to quickly and easily create AI-powered cross-channel conversational bot with a point and click interface. 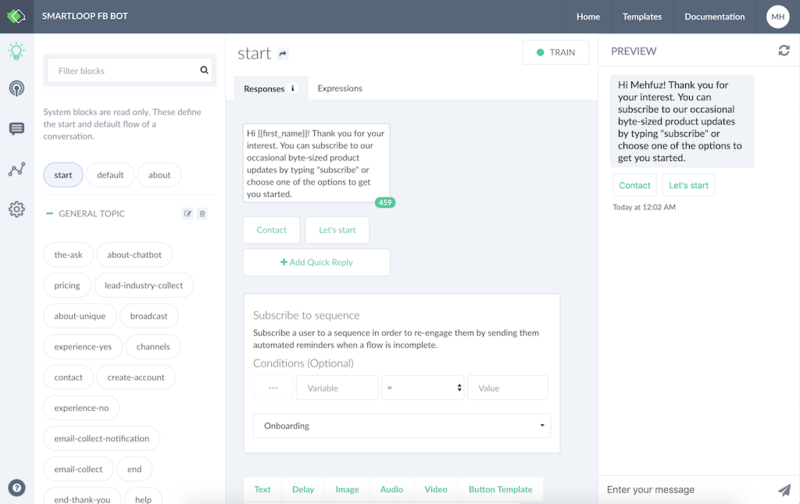 Measure and understand your users through conversational analytics, segment and re-engage based on user actions and variables in just a few easy steps. The platform offers you full advantage of the range of structured and rich message types these channels have to offer, all via one easy-to-use and consistent interface. Creating a bot (a.k.a. automated agent) is easy and free. Create an account and head to the Getting Started section to publish your first conversational bot. Having trouble finding what you’re looking for? Tell us so we can better help you!